Can Machines Build Enough Muscle? If you're looking to add muscle, machine training can help—but only to a certain degree. 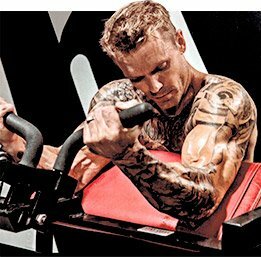 Here's how and when to use machines for gains. Let's settle this argument once and for all, right here and now: You can build muscle with either machines or free weights. Of course, this article can't end abruptly after one sentence. That's because there are some situations in which one type of equipment is a better choice. We're here to help you better understand when machines have an advantage, and when free weights do. Ultimately, you'll want to include both in your workout, but you'll want to include them at the right times. Before I dive into the pros and cons, a note on technology. Barbells and dumbbells haven't changed much over the past 50 years, but machines have changed a lot. By and large, technology has made machines safer and more effective over time. "Barbells and dumbbells haven't changed much over the past 50 years, but machines have changed a lot. By and large, technology has made machines safer and more effective over time." With free-weight training, balancing the weight and controlling the movement can be difficult, especially for the uncoordinated beginner. The proper biomechanics are predetermined with machine movements—typically, the movement is limited to a single predetermined plane. Rehearsing the movement pattern over and over again conditions your muscular and nervous systems so you can get a feel for the movement. That makes switching over to barbells and dumbbells easier later on. "Machines are a great place for beginners to start because they're learning the proper biomechanics and how to feel the mind-muscle connection," says BPI Sports East Coast Sales Manager Whitney Reid, a fitness model and former competitor. Never allow the machine to settle on the stack between reps. If the weight touches down against the stack in the fully stretched position, even if for just a moment, tension is released on the muscle. Re-adjust the machine so that you can fully stretch a muscle without the weight touching down on the stack. Challenge Yourself. Since you don't have to worry about balancing a weight, don't be afraid to push yourself. Just because machines make the movement pattern easier doesn't mean you should use less effort. Don't be afraid to challenge yourself with heavy weights. Depending on the machine, you typically don't have to be as concerned about maintaining proper posture because the machine puts you in a safe and supported position. This is especially critical when it comes to your spine, from your neck to your lower back. Anyone who has ever bench pressed solo with a heavy weight knows the danger of a barbell getting stuck on his chest. And with some movements, such as overhead presses, moving the weights into the start position can be difficult. Machines allow you to work safely with heavy weights or to muscle failure without a spotter, reducing your risk of injury or "getting stuck." Most machines have mechanisms that allow you to adjust the unit based on your height, body type, or limb length. Since the person who used it immediately before you probably isn't your twin, you'll need to make some adjustments. Test the settings by doing a light set to ensure the movement pathway feels natural before adding heavy weights. If your joints are sore or you're rehabbing from an injury, machine moves are sometimes less painful than their free-weight counterparts. That's because free weights normally make the connective tissue work harder to stabilize a joint. Normally, that's good, but it can irritate a pre-existing injury. By restricting the range of motion, it's easier to safely train a target muscle with less pain. That being said, a machine may lock you into a plane of movements that's particularly painful, so experiment with light weight ahead of time before going heavy. No one can completely isolate a particular muscle. With machines, though, you can reduce the contribution from stabilizers and minimize stress on joints. This results in greater emphasis on the target muscle. "That's one of the key advantages of machines, especially for more experienced lifters," says Reid. "[After you do your heavy free-weight moves and your stabilizers become fatigued], machines allow for constant tension and you get better isolation, which is a great way to finish your workout. You can force more blood into an area to exhaust the muscle." Machines have an edge over free weights when it comes to training past failure. 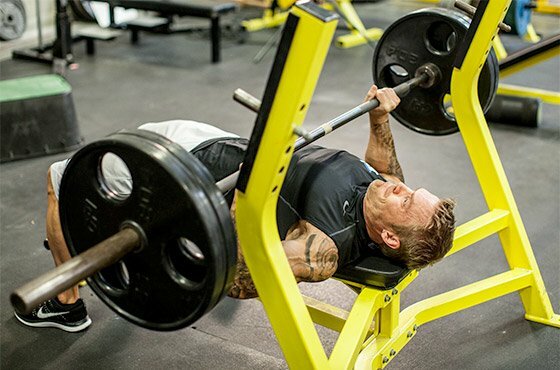 For example, using the rest-pause technique (resting for just 15-20 seconds between segments) is easier on a machine press than when doing dumbbell bench presses, because getting the weights into position at the start and end of each segment is time-consuming. Other types of intensity-boosting techniques that can be easier with machines include dropsets, heavy negatives (lowering a heavy weight very slowly), and forced reps. While restricting the movement to a single plane may be an advantage for beginners learning the correct movement, it can be a disadvantage for more experienced lifters. With free weights, you control the movement—not just against gravity, but from north-south and east-west directions as well. Think of overhead dumbbell presses for shoulders or incline dumbbell presses for chest, in which you push the weights not just up but together as well. This requires additional coordination from stabilizer muscles, meaning more total muscle groups are involved in the lift. The free-weight movement is always harder than its machine counterpart, so core muscle groups are working harder and you're burning more total calories. In many cases you'll get a slightly longer range of motion as well. "Inherently that's the biggest advantage of free weights—you can do those multi-joint movements that are best for size and strength," explains Reid. "If you want to put on quality size, the bench, squat, and deadlift must be incorporated into your training." "The free-weight movement is always harder than its machine counterpart, so core muscle groups are working harder and you're burning more total calories." Machines help you isolate a given muscle better because they minimize the contribution from stabilizers, whereas barbell and dumbbell training does the opposite. While core and secondary muscle groups are stressed to a greater degree, so too is the connective tissue (tendons, ligaments) that the muscle fibers attach to. Strengthening the connective tissue is one major advantage of free-weight training. Because you can place a greater demand on your body with free-weight training, it's capable of boosting the release of anabolic hormones such as growth hormone (GH) and testosterone. Both of these hormones are essential for muscle building, so following a protocol that induces a greater response will have better overall muscle-building value. "By including heavy compound movements such as deads and squats in your free-weight routine, you'll get greater testosterone and GH release," says Reid. Sure, you can adjust most machines for your body type, but what if you're very tall or short, or have long or short limbs? Most machines were constructed for average builds, and some might not fit your body type. Forcing a joint into an ill-suited position can increase the pressure on it, which can contribute to soreness or injury. If a machine doesn't feel right, despite your best efforts to make adjustments, find another machine or do the free-weight alternative. The strength you build on machines doesn't always transfer well to sports and other activities you do outside the gym, because you simply don't get the benefit of using the machine once you leave the gym. During sports activities, your body is typically in motion and frequently off-balance, and that chaos is nearly impossible to duplicate on a machine. You also don't improve your coordination and balance when you rely on machine training. "I played sports through college, and I always recommend free weights for athletes in training," says Reid. "Athletes need functional strength for production on the field or court. Movements such as cleans, deads, and squats are key for speed, power and agility, which leads to higher athletic performance." If you train at home, a simple set-up that includes an adjustable bench and adjustable dumbbells allows you to get in a full-body workout. You'd need to spend thousands of dollars on machines to get a comparable workout, and all of those machines would take up a lot of space. For most home trainees, that's simply not practical. Clearly, there's a time and place for machines in your training arsenal, though for most individuals looking to gain mass free weights have a distinct advantage. One useful way to incorporate both is to start your workout with free weights. Toward the end, as fatigue starts to set in, finish your workout with machines. That way you can push yourself to your limit without worrying about balancing a weight. In that sense, you can get the best of both worlds from machines and free weights.